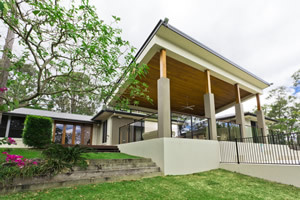 Brisbane low maintenance outdoor living spaces. Your landscape living areas can contain many different aspects of landscaping within the space. Consider adding some of these elements to your outdoor living space; Decks, pergolas, inorganic mulch, ornaments, outdoor furniture, water features and outdoor kitchen areas. 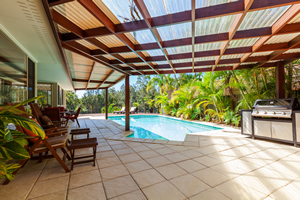 Brisbane Home landscaping can create your new outdoor living space to suit and complement your home, consider a lavish garden with the right drainage solutions for your home and land. Is your yard un-even and oddly shaped? Terry and his team can create a functional and visually pleasing outdoor space for you offering low maintenance paving or decks, or a horticultural delight with turf and plants to add dimension to your home. You also have the additional element of creating levels within your space or adding steps or stairs to your yard for both function and feature. Garden styles such as formal, cottage and tropical are popular and lasting garden designs which work well in the Queensland sun. Choose North Brisbane's leading landscape construction team to transform your space into an entertainers paradise.